the art of mindful eating : Full Catastrophe Living by Dr. Jon Kabat-Zinn. 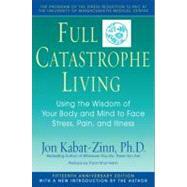 Full Catastrophe Living by Dr. Jon Kabat-Zinn. Have you ever looked at a dog and really seen it in its total "dogness"? A dog is quite miraculous when you really see it. What is its "view" of things, of the neighborhood? Children tend to think about things this way. Their vision is fresh. They see things as if for the first time every time. Sometimes our seeing gets tired. We just see a dog. "If you've seen one, you've seen them all." So we barely see it at all. We tend to see more through our thoughts and opinions than through our eyes. Our thoughts act as a kind of veil preventing us from seeing things with fresh eyes. What comes into view is identified by the thinking, categorizing mind and quickly framed: a dog. This mind actually prevents us from seeing the dog in its fullness. It processes and categorizes the "dog" signal very quickly in our brain and then moves on to do the same to the next perception or thought. When my son was two years old, he wanted to know if there was a person inside of our dog. It warmed my heart to see through his eyes in that moment. I knew why he was asking. Sage was a real family member. He had his rightful place. His presence was felt, he participated in the psychic space of the house, he was a complete being, as much a "personality" as any of the people in the family. What could I say to him? Never mind dogs. What about a bird, or a cat, or a tree, or a flower, or a rhinoceros?! They are all quite miraculous really. When you really look at one, you can hardly believe it exists; there it is, this perfect thing, just being what it is, complete in itself. Any imaginative child could have dreamed up a rhinoceros, or an elephant, or a giraffe. But they didn't get here as the product of a child's imagination. The universe is spinning these dreams. They come out of the universe, as do we. It doesn't hurt to keep this in mind on a daily basis. It would help us to be more mindful. All life is fascinating and beautiful when the veil of our routinized thinking lifts, even for a moment. There are many different ways of looking at any thing or event or process. A dog is just a dog. In one way there is nothing special about it; at the same time it is extraordinary, even miraculous. It all depends on how you are looking at it. We might say that it is both ordinary and extraordinary. The dog doesn't change when you change the way you look. It is always just what it is. That is why dogs and flowers and mountains and the sea are such great teachers. They reflect your own mind. It is your mind that changes. When your mind changes, new possibilities tend to arise. In fact everything changes when you can see things on different levels simultaneously, when you can see fullness and connectedness as well as individuality and separateness. Your thinking expands in scope. This can be a profoundly liberating experience. It can take you beyond your limited preoccupations with yourself. It can put things in a larger perspective. It will certainly change the way you relate to the dog. When you observe things through the lens of mindfulness, whether it be during formal meditation practice or in daily living, you invariably begin to appreciate things in a new way because your very perceptions change. Ordinary experiences may suddenly be seen as extraordinary. This does not mean that they stop being ordinary. Each is still just what it is. It's just that now you are appreciating them more in their fullness. Looking for the best way to manage and reduce stress using mindfulness?